As Miguel "Mickey" Roman prepared for his upcoming bout against junior lightweight world titleholder Miguel Berchelt (Saturday, ESPN+, 9:30 p.m. ET), he had a peculiar tradition for a boxer who is training for battle. He had a weekly doughnut. Yeah, those delicacies that are basically fried fat sprinkled with sugar, which aren't exactly associated with the type of disciplined diet that is required to make weight. Every Wednesday morning he would meet his trainer, Rudy Hernandez, at a Yum Yum Donuts in Los Angeles. It's what they have dubbed 'Doughnut Wednesday'. "He's entitled to have a doughnut. He'll have a tea, a coffee, whatever his desire is," explained the veteran cornerman, who began working with the experienced Mexican fighter for his TKO victory over Orlando Salido one year ago. Hernandez, the brother of the late Genaro Hernandez, a former 130-pound world titleholder, was a fighter himself. He is a believer in the old-school way of doing things. And one clear edict he laid down to Roman, (60-12,47 KO's) was that his days of starving his way down to weight were over. He would eat -- and eat often. "Ain't that funny, that in today's era you would think that these guys have a little knowledge about nutrition," said Hernandez on Wednesday after a sparring session at the Maywood Boxing Club in Maywood, California, a working-class suburb about 10 minutes outside of Los Angeles. "He had 69 fights and on fight number 70 he came to work with me and the first thing I changed is he had to eat." Back on Dec. 9, at the Mandalay Bay Resort and Casino in Las Vegas, Roman pulled the upset by wearing down the shopworn Salido in nine rounds. It was clear on this night who was the fresher, more vibrant fighter. Prior to that bout, Hernandez had to cajole the 32-year-old Roman to eat full, healthy meals prior to the weigh-in. "He had no idea what it was to eat before a fight," said Hernandez. "In that fight against Salido he had breakfast that morning (of the weigh-in). He was in shock and it just blew his mind." "First of all, that way of eating, preparing myself the way I did, I never did it that way before," explained Roman, through his manager, Jaime Quintana. "I mean, I adapted pretty well to the change and you can see now that I was a different fighter, I felt stronger." But he admits that he was concerned as Hernandez put full plates of food in front of him closer and closer to the fight. "I was very scared because I wasn't used to it," said Roman. "In the beginning I was rejecting to eat that way but I ended up saying, 'I'm going to eat, you put it on the table, I'm going to eat it. If I'm overweight, it's your fault guys.' So I obeyed and nothing happened." There's an axiom in combat sports that there are two battles: one versus the scales as you attempt to make weight and then the actual fight. And many combatants will tell you the first one is actually more arduous. Like many of his pugilistic colleagues, Roman in the past would merely starve and sauna his way down to weight. "Definitely, yes," admitted Roman, who began his career in 2003. "I had to starve because I had no team. The people that I had before didn't know what to do and now with this team, I have no doubt it's helping me a lot. I'm doing things differently." For Roman, who for years was a boxing vagabond, this signaled a seminal shift in his career. For the first time, he's getting real guidance. "(With) Rudy Hernandez and Jaime Quintana as a new team, I see a big difference," explained Roman. "Me eating so well allows me to do these things inside the ring differently now." Hernandez is a trainer who simply doesn't believe in modern strength-and-conditioning coaches, who have become so in vogue in recent years. In his view, all they do is give the fighter a tighter set of abs at the cost of over-training. So while the fighters look more muscular at the weigh-in, Hernandez is of the opinion they oftentimes have nothing left for the actual bout. "You've got to remember that to get in shape you've got to be able to perform," Hernandez points out. "If you come to the gym where you haven't had nutrition and you haven't really eaten in several days that much, how do you expect to function in the gym?" So is a happy and content fighter, a better fighter? "What do you think?" asked Hernandez, rhetorically. "C'mon, I mean if a guy comes here happy, he's going to perform. If he's comfortable, he's going to perform. But if he's low on fuel, how do you expect him to work?" Roman is a fighter who has a lot of miles on the odometer, having boxed 438 professional rounds. Now he is at least a well-fueled one -- even during fight week. While most boxers begin the process of cutting back on their intake during fight week, according to Hernandez, Roman had a breakfast on Wednesday featuring an omelette with egg whites, a Caesar salad with chicken for lunch and a dinner that included a sizable plate of fish. The only adjustment made at this stage is they will cut down on the carbs. "No rice," said Hernandez, and he requires Roman to drink two liters of water daily. And in an ode to his traditional roots -- when as a welterweight (who had a pro record of 16-4-1 with 6 KOs) from 1980 to 1988 he was forced to weigh-in the morning of the fight -- Hernandez will have Roman actually run for about 20 minutes and shadowbox a few rounds this Saturday morning. "Back in the day, that's how I was brought up," said Hernandez. "I would train at 7 o'clock in the morning and be done by 9:30 and weigh-in at 10 o'clock. Then I'd fight 10, 12 rounds that night." The gutty Roman -- who has scored two knockout victories in 2018 coming into this bout -- will enter the Don Haskins Arena as an underdog versus Berchelt (34-1,30 KOs), who many regard as the premiere 130-pounder in the world. This matchup figures to be an entertaining battle between two hard-nosed, fan-friendly Mexican fighters. There's a long tradition of ring wars featuring boxers from south of the border. The question is, while it's clear that Roman will want to mix it up in there, will Berchelt comply? "Berchelt is the champion, he's the best and I'm ready to fight the best. I have plan A and a plan B. We're ready for anything against Berchelt," Roman said. 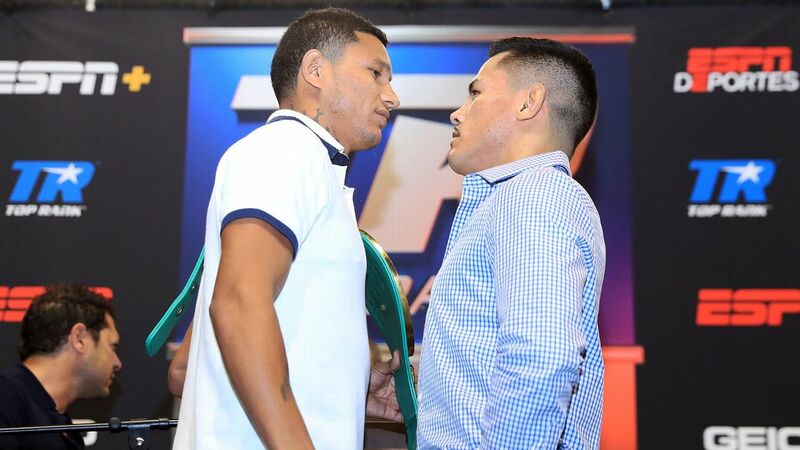 Berchelt has shown against the likes of Takashi Miura that he can box his way to victory against dangerous punchers. Roman and his side prefer an old-fashioned Mexican battle. "Of course, that's Mickey's strong point, being able to fight toe-to-toe," admitted Hernandez. "But I see it going both ways, I see moments where they will be going toe-to-toe and I see moments where they'll be boxing and I'm saying this -- we can box, too. Mickey's a little underrated. He doesn't even know he can box." Hernandez continued, "So he's boxing well and it's coming along and we hope that by fight time it shows that he has improved. And by him improving just a little bit that gives us a better chance. Berchelt has several ways of fighting and so does Mickey. So whatever Berchelt wants to do, we'll be ready for it." Roman will have to put up a career-best effort to topple Berchelt, who is in his physical prime at age 26. But even 15 years into his run, he says there are more things that he can learn. "I've made changes, I'm learning a lot." Including the need to eat as he trains. By the way, what's his preferred doughnut? "Chocolate with nuts on top."